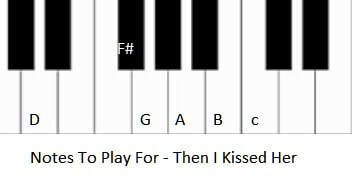 The sheet music for And Then I Kissed Her is in the key of G and the letter notes are the same as the sheet music. There's also an image showing what piano notes to use, and there's isn't many, just 6 notes in total. I can't remember which version I heard first, the beech boys or The Crystals. Both versions are great anyway.